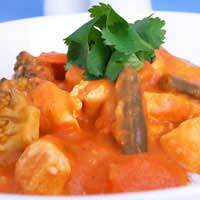 Even if you are not a vegetarian a vegetable curry is both warm and filling. This meal can be served at any time of the year and you can vary the vegetable according to the seasonal variations. A vegetable curry is an easy way to eat your five vegetables for the day; in fact it is very easy to eat ten with these types of vegetable dishes. Adding pulses and beans to the curry will make a very warming winter recipe and is easy to do. Simmer lentils in stock until cooked or simply add a can of baked beans in tomato sauce in the final stages or cooking or even a can of chickpeas for variety. Not only will it make the meal go further but will add bulk and interest for vegetable eaters. Slice the butternut squash in half lengthways without peeling. Remove the seeds and place on a baking sheet on the middle of the over for 45 minutes. In a deep pan add the oil and when hot add the onion and fry until soft but not brown. Add the garlic, coriander, cumin, turmeric and chilli and fry until sizzling. Add the carrot, peppers and potato and cook until slightly soft and coated with the curry paste. Add the can of tomatoes and a little stock and simmer for twenty minutes. Scoop the cooked flesh from the butternut squash and add to the curry as well as the courgette and the mushrooms. Add more stock if needed. The squash will thicken the curry so you should not need to add any form of thickener such as gravy granules or cornflour. Serve with fluffy white rice or brown wild rice. If you prefer you can omit the potatoes and instead serve cooked new potatoes that have been fried in black onion seeds and mustard seeds for a tasty alternative. You can also use dried instant potato to thicken a curry or a stew. Simply add a teaspoonful at a time until you have the desired thickness. If you are serving this meal to meat eaters you can easily serve the recipe with cooked meat leftovers from a roast joint or chicken to make a tasty alternative. This meal can be frozen but freeze without the courgettes and mushrooms as they tend to be rather watery upon defrosting. Now check out the vegetarian lentil curry on this site. Great recipe, very easy to follow - turned out delicious!! this is different to all the other websites... it's got different ingredients and different method, im confused, can't the websites have the same method and ingredients for the right recipes.